THE PEYOTE RITUAL as practiced by Indians in the United States varies somewhat from tribe to tribe. A typical Plains Indian ceremony takes place weekly in an all-night meeting in a teepee. Worshipers sit in a circle around a half-moon altar of sand (see p. 6) on which a large specimen called a "Father Peyote" is set and at which a sacred fire burns. The ashes are shaped into the form of a thunderbird. The ceremony, led by a "roadman,'' consists of chanting accompanied by rattle and drum, alternating with prayers, lessons, testimonies, and occasionally a curing ritual. At night dried peyote tops (mescal buttons) are moistened and swallowed--from 4 to 30 or more. The ritual ends with breakfast at down when the teepee is hauled down. 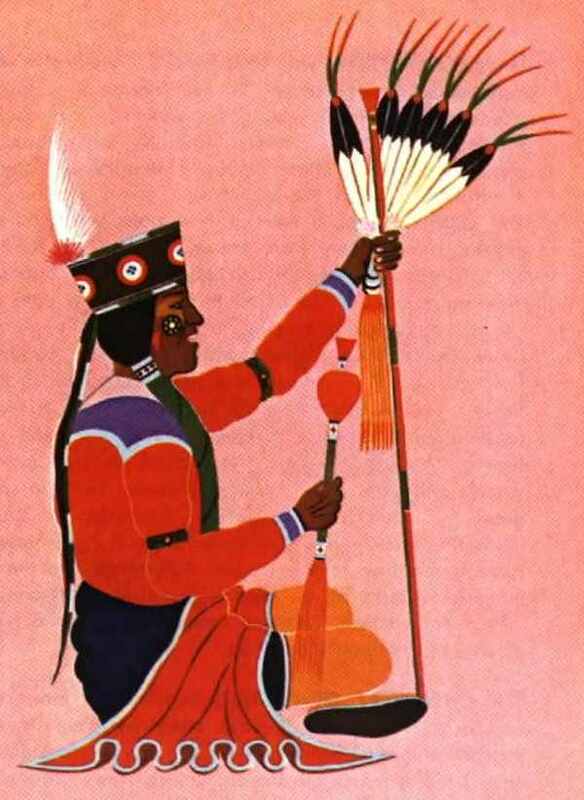 Indian painting of Peyote "roadman"--leader of the Peyote ceremony. A PEYOTE VISION was described by a scientist who experienced it as follows: " . . . clouds . . . Oil of pheasant turns into bright yellow star; star into sparks. Moving, scintillating screw; hundreds of screws. A sequence of rapidly changing objects in agreeable colors. A rotating wheel in the center of a silvery ground . . . The upper part of a man with a pale face and red cheeks, rising slowly from below. While I am thinking of a friend, the head of an Indian appears. Beads in different colors . . . so bright that I doubt my eyes are closed.... Yellow moss like saltwater taffy pierced by two teeth. Silvery water pouring downward, suddenly flowing upward . . . exploding shells turn into strange flowers . . . A drawing of a head turns into a mushroom, then a skeleton in lateral view . . . Head and legs are lacking . . . Soft, deep darkness with moving wheels and stars in . . . pleasant colors. Nuns in silver dress . .. quickly disappearing. Collection of bluish ink bottles with labels. Red, brownish, and violet threads running together in the center. Autumn leaves turning into mescal buttons . . . Man in greenish velvet jumping into a deep chasm. Strange animal turns into a piece of wood in horizontal position." THE CHEMISTRY OF PEYOTE is extremely interesting and is still subject to intense study by chemists and pharmacologists. More than 30 active constituents have been found in the peyote tissues. 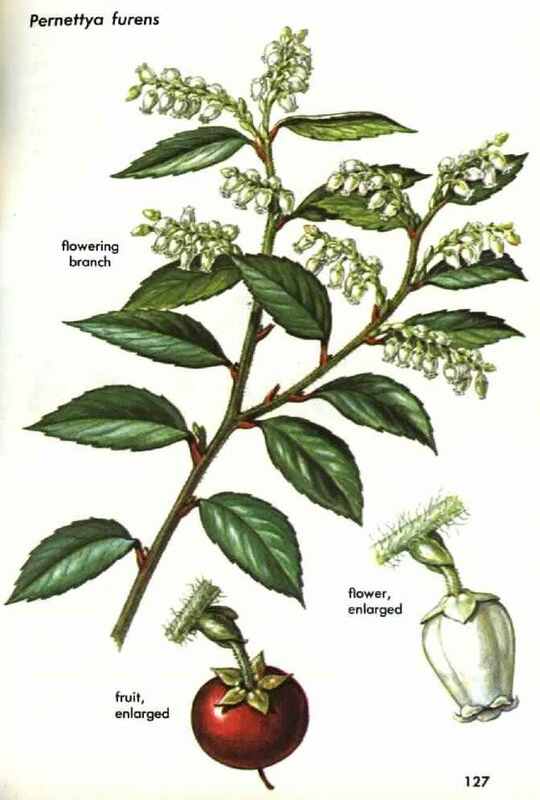 They are mainly alkaloids of two types: phenylethylamines and isoquinolines. 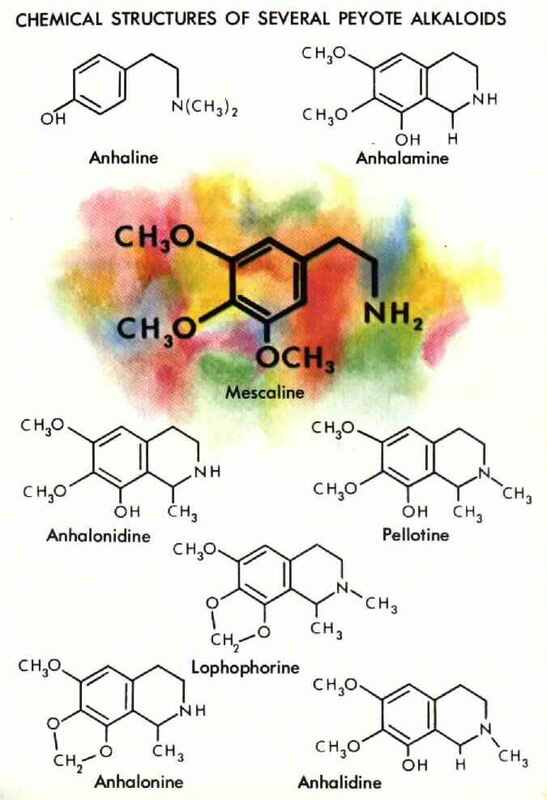 Much pharmacological and psychological research hos been done on mescaline, the alkaloid responsible for the colored visions, but the effects of most of the other constituents, alone or in combination, are not well understood. "FALSE PEYOTES" are other species of cactus used by the Tarahumare and Huichol Indians of northern Mexico. One, called hikuli mulato, is believed to make the eyes so large and clear that the user can see sorcerers. This small cactus has been identified as Epithelantha micromeris. A species known as hikuli sunami (Ariocarpus fissuratus) is said to be more powerful than peyote (hikuli), and the Tarahumare believe that robbers are powerless to steal when this cactus calls soldiers to its aid. Hikuli walula saeliami, meaning "hikuli of greatest authority," is so rare that it has not yet been identified, but it is reputedly the most powerful of all hallucinogenic cacti. 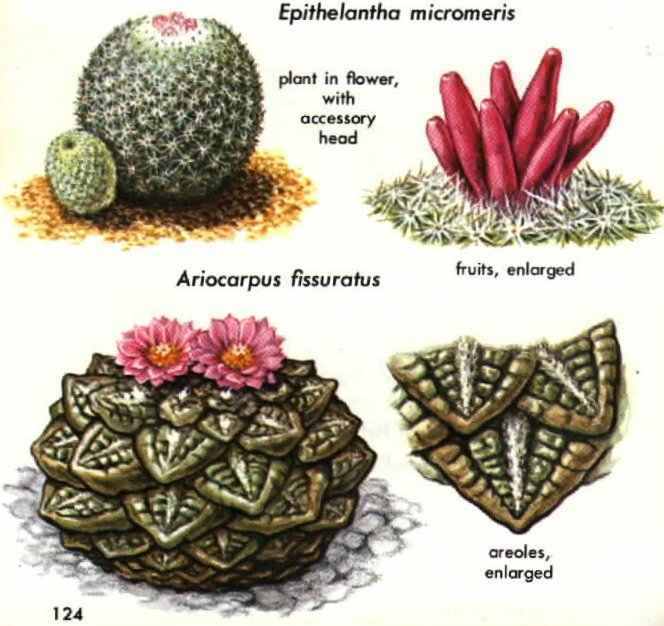 Among the Huichol, tsuwiri (Ariocarpus retusus) is considered dangerous to eat; it is believed capable of sorcery and deception, driving a man mad in the desert if he has not been properly instructed by the shaman or is not in a state of ritual purity that allows him to find the true peyote plant. Nothing is known of the chemistry of Epithelantha. 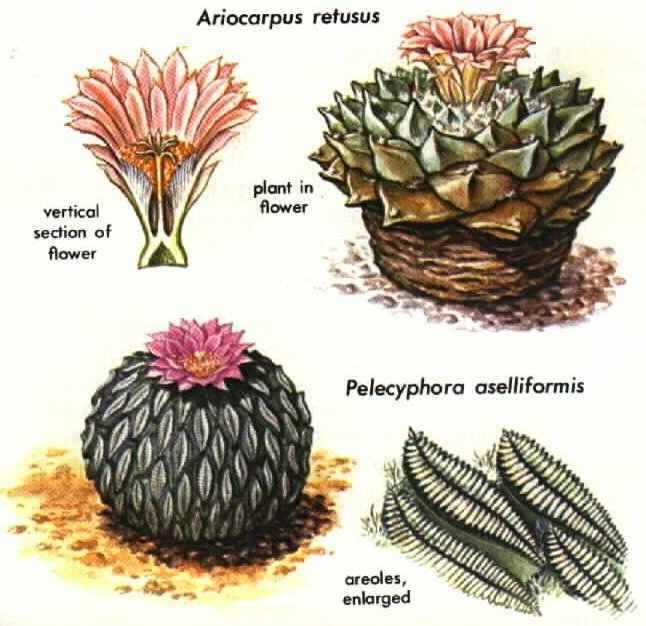 Several toxic alkaloids, especially anhalonine, have been found in Ariocarpus, but mescaline is apparently absent. Pelecyphora aselliformis, another "false peyote," has recently been found to contain alkaloids. 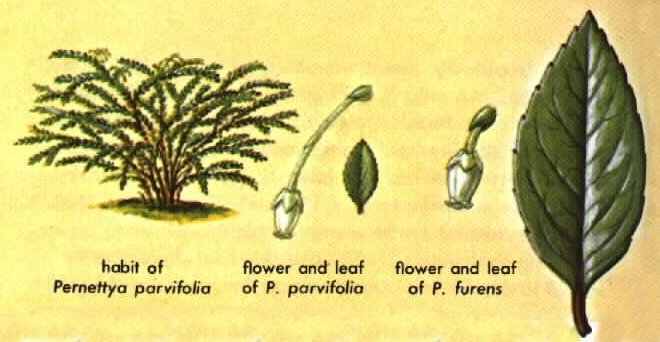 HIERBA LOCA and TAGLLI (Pernettya furens and P. parvifolia) are two of about 25 species of Pernettya, mostly very small subshrubs that grow in the highlands from Mexico to Chile, the Galápagos and Falkland islands, Tasmania, and New Zealand. These plants belong to the heath family, Ericaceae, along with the cranberry, blueberry, Scotch heather, rhododendron, and trailing arbutus. Several species are known to be toxic to cattle and man, but only these two are known definitely to be employed as hallucinogens. Pernettya furens, which in Chile is called hierba loca ("maddening plant") or huedhued, has fruits that, when eaten, can cause mental confusion, madness, and permanent insanity. The intoxication resembles that following the ingestion of Datura. The fruit of tagili, of Ecuador, is well recognized as poisonous, capable of inducing hallucinations and other psychic alterations as well as affecting the motor nerves. Though the chemistry of these and other species of Pernettya needs further study, it seems that the toxicity may be due to andromedotoxin, a resinoid, or to arbutin, a glycoside. Both compounds are rather common in this plant family. SACRED MEXICAN MORNING GLORIES of two species (Rivea corymbosa and Ipomoea violacea) provide Mexican Indians with hallucinogenic seeds. Although the morning glory family, Convolvulaceae, has been important as the source of several medicines and many ornamentals, only in recent years has it been discovered that some of the 1,700 temperate and tropical species contain highly intoxicating principles. In other parts of the world the concentration of these principles may be higher than in the Mexican morning glories, yet they seem never to have been used as hallucinogens. Shortly after the conquest of Mexico, Spanish chroniclers reported that ololiuqui and tlitliltzin were important divinatory hallucinogens of Aztec religion, magic, and medicine. 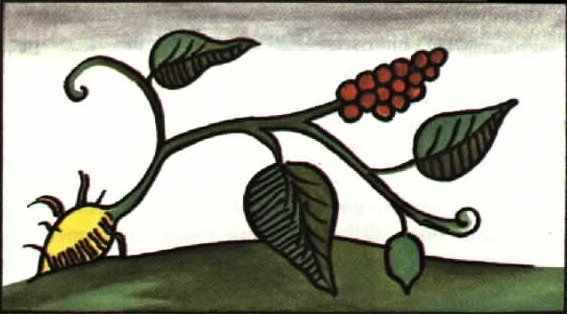 Ololiuqui is a small, round, brownish seed from a vine, coatl-xoxouhqui ( "snake plant" ), with heart-shaped leaves and white flowers; tlitliltzin is a black, angular seed. These were recently identified respectively as the seeds of Rivea corymbosa and Ipomoea violacea. Since botanical nomenclature in this fomily is not always clear, these two species are sometimes called Turbina corymbosa and Ipomoea tricolor, respectively. Whereas much was written about ololiuqui, tlitliltzin was merely mentioned in the ancient writings. Earliest illustration of Rivea corymbosa, also known as ololiuqui (Hernandez; Rome, 1651). MEDICAL AND RELIGIOUS USES of the morning glory called ololiuqui were of major importance to the Aztecs. Ololiuqui is presumed to have pain-killing properties. Before making sacrifices, Aztec priests rubbed themselves with an ointment of the ashes of insects, tobacco, and ololiuqui to benumb the flesh and lose all fear. 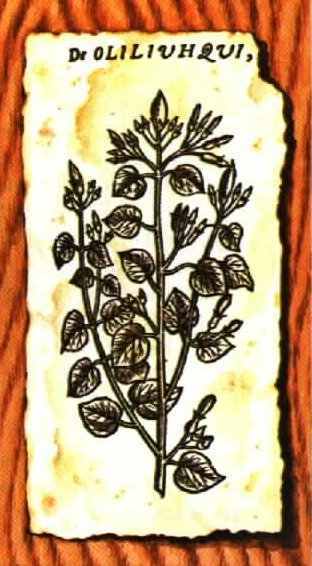 Hernández, physician to the King of Spain, wrote that "when the priests wanted to commune with their gods and receive messages from them, they ate this plant to induce a delirium, and a thousand visions . . . appeared to them." One early chronicler wrote that ololiuqui "deprives of his senses him who has taken it, for it is very powerful." Another contended that "the natives communicute in this way with the devil, for they usually talk when drunk with ololiuqui and are deceived by the hallucinations which they attribute to the deity residing in the seeds." The seeds were venerated and placed in the idols of Indian ancestors. Offerings were made to them under the strictest secrecy in places unknown to persons not involved in the worship. IDENTIFICATION of ololiuqui and tlitliltzin as morning glories had to wait for four centuries, because efforts of the Spanish to eradicate the use of these sacred hallucinogens drove them into the hills. Several crude drawings in the chronicles indicated that ololiuqui was a morning glory. Mexican botanists identified it as such as early as 1854. But doubts persisted because the morning glory family was thought to be devoid of intoxicating principles, and no member of the family had ever been seen employed as an hallucinogen. Mainly on the basis of similarity of the flowers, it was suggested early in the 1900's that ololiuqui was not a morning glory but a Datura (p. 142), a known hallucinogen still used in Mexico. Not until 1939 were actual specimens of Rivea corymbosa used in Mazatec Indion divinatory rituals collected in Oaxaca and identified as the ololiuqui of the ancient Aztecs. Ipomoea violacea was found 20 years later in ceremonial use among the Zapotecs of the same region and identified as tlitliltzin. An illustration of ololiuqui in fruit, from Sahagún's Historia de las Cosas de Nueva España, vol. IV, book Xl. Sahagún, a Spanish friar, wrote about the marvels of the New World in the years 1529-1590.